This is my ideal curry. I could eat it every day. Until forever. 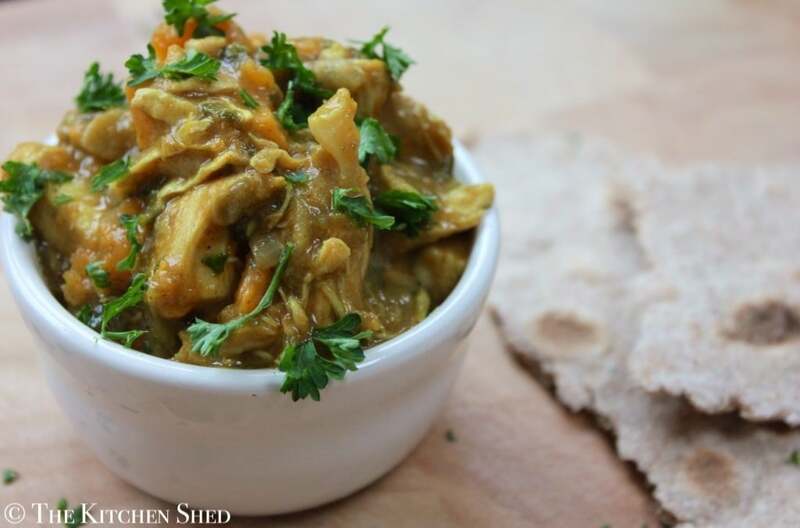 I have adapted it from a recipe by Lorraine Pascal called ‘Sri Lankan Curry’ which I tried last summer. It needed a little ‘clean’ up but even then, Clean Eating to me is not just about eating something that’s just made from natural ingredients. Clean Eating is about getting as many healthy vitamins, minerals and goodness into my body as possible. I’ve added onion, sweet potato, kale and mushrooms to this dish to give it an extra bit of loving from the vegetable department, but you could use any vegetables you like. A handful of raisins would probably work well in it too. 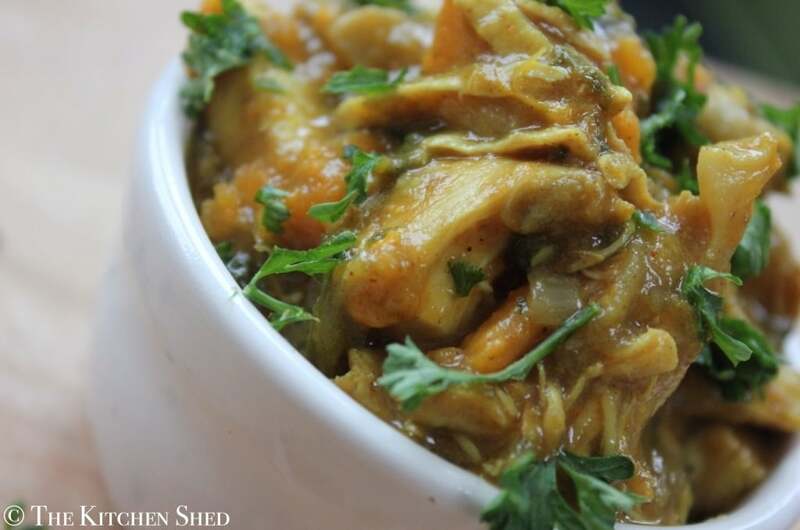 This Clean Eating Chicken and Sweet Potato Curry is minimal work and seems to just cook itself. 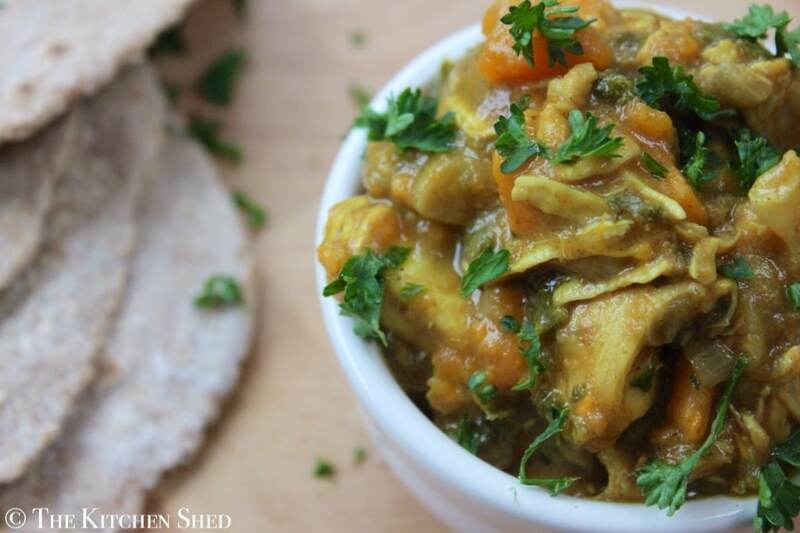 Its perfect alongside some wholegrain rice or homemade Clean Eating Indian Chapattis. Did I mention it’s the best curry ever? Make sure all of your ingredients are ready to go, including all of the spices and salt measured out and placed together in a bowl. Pour the oil into a large saucepan and add the onion, sweet potato, mushrooms and kale and cook on a low heat for 4-5 minutes. Stirring occasionally. Add the garlic and spice mix and stir for 20 - 30 seconds. Add the coconut milk and water and turn the heat to high. Once bubbling, turn the heat to low and add the chicken mini fillets whole to the curry. Put the lid on the saucepan and simmer for 20 minutes, stirring occasionally. After 20 minutes, remove the lid and using a slotted spoon, take out the chicken and place into a bowl or plate. Shred the chicken up with two forks and then put it back into the curry. Cook the curry for a further 10 - 15 minutes uncovered until reduced and thickened. Sprinkle with chopped parsley or coriander and serve with wholegrain rice or some homemade chapattis. I was looking for this kind of a recipe. Thanks for sharing it..
I’m cooking this right now! Can you freeze this curry? Just wondering could i chuck this all in the slow cooker?? Did you get a reply to putting in slow cooker? This is now my go to curry recipe! So glad I stumbled across your site and blog! Just making this now and my kitchen smells amazing!!! Hope you love it as much as we do Danielle! Made this last night. Immense. As good as a takeaway. Hi! This looks great, before I cook does the chicken need to be pre cooked or can it go in raw? How many calories is this meal ? Its the same kind as the tinned coconut milk, not the Alpro one. I use the creamed coconut sachets to make up the milk instead of a tin these days. so glad I found this site so sick of processed meals and boring old meal times, forgot to add in the garlic but it was still delicious, my daughter who hates sweet potato loved it too!! Just made this but it’s very watery. I am trying to thicken it up before we can eat! I would suggest adding 100ml and see how that goes. Can always add, but can’t take it back out.